RJ45 Repair #3DPrinting #3DHangouts « Adafruit Industries – Makers, hackers, artists, designers and engineers! 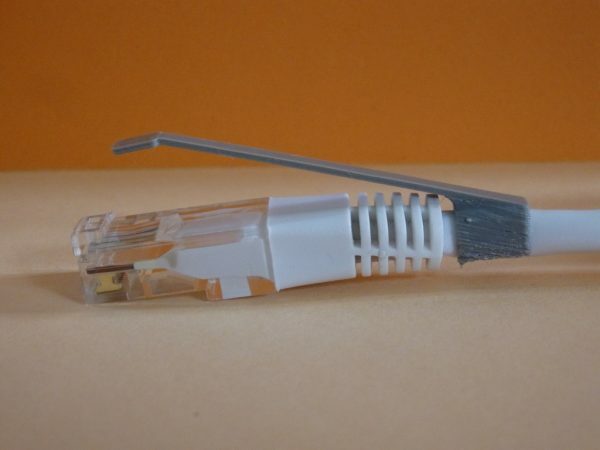 Here is an accessory that allows the use of an RJ45 plug whose clip is broken. After printing the accessory, rotate the square end as shown in the picture. This is to create the blocking of the plug, clipping the accessory on the cable so that the square comes to rest on the plug in the place of broken tab.